This book approaches the traditional topics of a marriage book with the brutal and life-giving honesty of two millennials who have fought together for their marriage. All topics are addressed through the vulnerable lens of the authors’ own struggles and mistakes. This is a no-holds-barred, real-world . . . marriage book. He earned his B.S. in Biblical Studies from Calvary Bible College, his Masters Degree in Christian Studies from Calvary Theological Seminary and is currently working on his Ph.D. in Applied Theology with a North American Missions emphasis at Southeastern Baptist Theological Seminary. He has authored six published books; G.O.S.P.E.L., DNA: Foundations of the Faith (published through Moody Publishers), Bound to Be Free: Escaping Performance to be Captured by Grace, (published through NavPress), Authentic Love: Christ, Culture, and the Pursuit of Purity, Letters of the Revelation, To the One Who Conquers – Teen Bible Study: Freedom from Sin through the Revelation of Jesus Christ, (published through Lifeway). D.A. 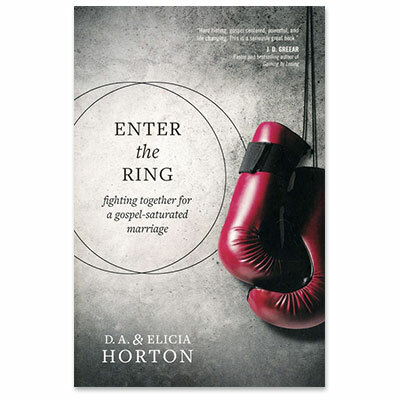 and his wife of 14 years Elicia have co-authored, Enter the Ring: Fighting Together for a Gospel-Saturated Marriage. D.A. and Elicia have two daughters, Izabelle and Lola and one son, D.A. Jr. (aka Duce).